“The first track of our debut CD, ‘Triangle Love,’ was written by our blind keyboard player, Steve Campos. Greg Adams, a founding member of Tower of Power, wrote the horn parts along with two other world-renowned horn players who recorded the horns for this song,” Fred Simon, drummer for the Usual Suspects, says. 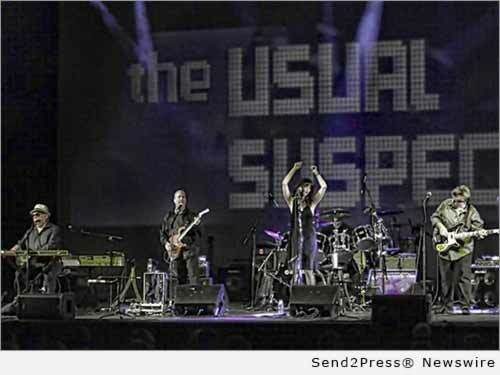 The Usual Suspects have a high level of musicianship with strong vocals and harmonies and delivers a wide range of musical styles from soul and progressive rock to funk and rhythm and blues. It’s this eclectic mix that makes them appeal to a wide range of audiences. Band members include: Lisa Margaroli, lead vocalist and frontwoman extraordinaire; Steve Campos, keyboardist, vocalist and songwriter; David Ownby, guitars, vocalist and songwriter; Scott Jehlik, bass, vocalist and songwriter; and Fred Simon, drums and bandleader. The doors for the show at the Saint Rocke open at 6 p.m. and tickets are $12. The new CD, “Back to Zero,” is available through all major online retailers, including CD Baby (http://www.cdbaby.com/cd/theusualsuspects1), Amazon, etc. Listen to their music here: https://youtu.be/2K44UsxbhNU. Formed in 2014, The Usual Suspects have been playing in the Orange County and Los Angeles area with some of the biggest names in the industry. They’ve performed with Blood, Sweat and Tears, Badfinger, America, The Winery Dogs and Jefferson Starship, to name a few. Voted the number one live music venue in the South Bay, Saint Rocke is the only live music venue in the U.S. to stream video live in high-definition. This high-energy music venue draws crowds with performances by up-and-coming rock bands in an intimate space. For more information: http://www.saintrocke.com/. * Photo Caption: The Usual Suspects on stage. Original Keywords: Back to Zero, blind keyboard player, Steve Campos. Greg Adams, Fred Simon, Lisa Margaroli, David Ownby, Scott Jehlik The Usual Suspects Los Angeles California LOS ANGELES, Calif.
REFERENCES: California Business News, Back to Zero, blind keyboard player, Steve Campos. Greg Adams, Fred Simon, Lisa Margaroli, David Ownby, Scott Jehlik The Usual Suspects Los Angeles California LOS ANGELES, Calif.